IN his continuing search for the more weird, wacky and wondrous in the world of travel, David Ellis says a dingo is helping to save an endangered Australian bush bird through the sale of her unique "artworks." Kaya, a five-year-old female at the Oakvale Farm and Fauna World in Port Stephens 2.5hrs north of Sydney, steps in paint and then onto a blank canvas in front of visitors, her resultant colourful paw-prints then sold to support conservation of the bush stone-curlew, a nocturnal ground-dwelling bird in danger of extinction on the Australian east coast. Oakvale owner, Kent Sansom says Kaya's artistic efforts are a hit with visitors. "Because she didn't get on well with the other dingoes, she lives by herself. 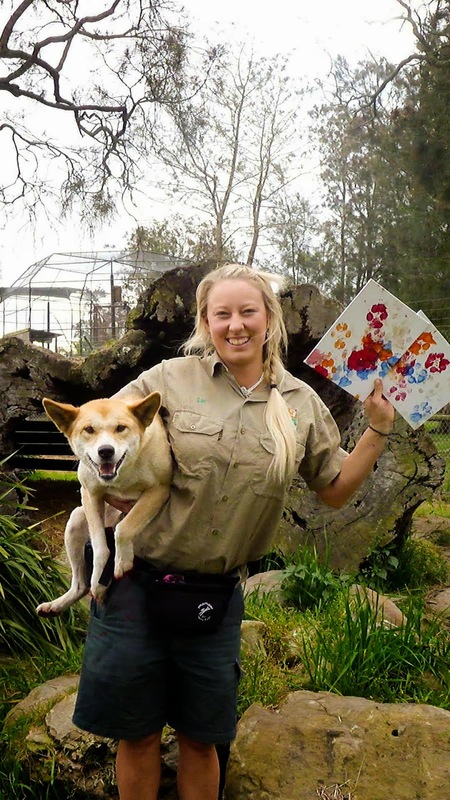 But as dingoes are highly intelligent, social animals so we decided to provide her with a fun activity, while also raising funds and awareness for the bush stone-curlew which we breed and release into the Murray River region to boost its populations." The park also has a range of native, exotic and farm animals including emus, kangaroos, koalas, birds, camels, deer, llamas, alpacas, cows, goats, sheep, pigs, donkeys, crocodiles and pythons that visitors can get up-close with. Details 02 4982 6222 or www.oakvalefarm.com.au, including days Kaya displays her painting skills. For details of Port Stephens' other attractions, www.portstephens.org.au. KAYA the artistic dingo with trainer, Lia Reeve-Parker.